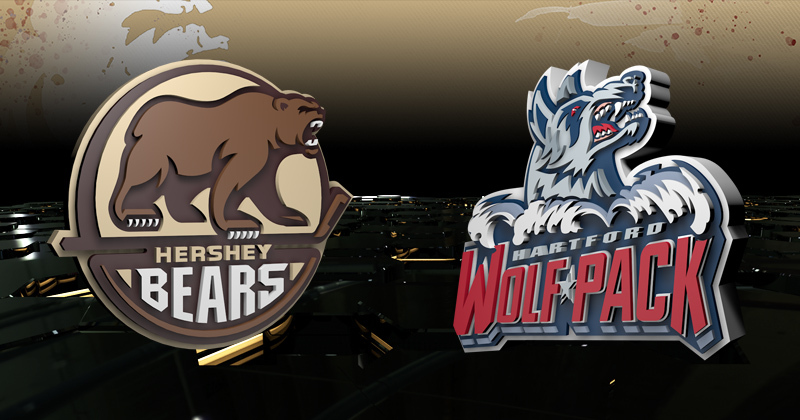 Game Preview: Bears at Wolf Pack, 7:15 p.m.
04/12/2019 - Tonight, the Hershey Bears hit the road for the final time in the 2018-19 regular season and battle the Hartford Wolf Pack. The Bears enter tonight perfect in their season series against the Wolf Pack through four meetings. The Bears start the club's final weekend of the regular season tonight after dropping a 3-2 overtime decision to the Lehigh Valley Phantoms on Tuesday at Giant Center. The Bears fell into a 2-0 hole as the Phantoms got a pair of goals in the middle frame, but Hershey fought back in the third, getting an early goal from Beck Malenstyn, and a tying goal on the power play from Maximilian Kammerer. The game progressed to overtime, and the Phantoms took the extra point on Connor Bunnaman's winning goal at 3:28 of the extra session. The Wolf Pack are coming off a 6-2 win over Binghamton last Sunday. Hartford got a pair of goals from Steven Fogarty, and netminder Brandon Halverson made 24 saves. Hershey is a perfect 4-0-0-0 versus the Wolf Pack this season, and tonight's game marks the first of two contests between the clubs on the weekend. In the last meeting on Mar. 10 at XL Center, both Vinni Lettieri and Devante Smith-Pelly had hat tricks in a 5-3 Hershey win. The Bears have also enjoyed great success at the XL Center. Hershey has won five straight games in Hartford, and a win today, would make it two seasons in a row that the Bears have swept the road portion of the season series between the two clubs. Tonight's game features a defender on each side that was named to the 2018-19 AHL All-Star Teams, as voted by AHL coaches, players and media in each of the league’s 31 member cities. Hartford's John Gilmour was named to the AHL First All-Star Team, and the leads all blue liners with 54 points in 67 games. Hershey's Aaron Ness was named to the AHL Second All-Star Team, ranking second among defenders with 51 points, and leading all blue liners in assists with 46. That is the largest amount of assists from a Hershey defender since Mike Gaul had a team-record 57 helpers in 1999-00. Forward Maximilian Kammerer has started to find his scoring touch and enters tonight's game on a four-game point streak. Kammerer, who has four goals on the season, has scored in three of his past four games, and has three goals and one assist in the streak. The Dusseldorf, Germany native has 13 points in 31 games this season. His first AHL goal came versus the Wolf Pack on Dec. 8 in a 6-3 win at Giant Center.